By listening to the needs of the glass industry, Tri-Star Glove created this cut and puncture resistant garment with 360º neck protection. CutPro® Vintage fabric made with 100% virgin Twaron® and stainless steel for strong cut and puncture protection. It will not burn, melt, or drip. A 360º collar with hook and loop closure for a secure and comfortable fit. The top of the collar is a high-visibility yellow mesh with wicking properties. Two high-visibility vertical stripes down the front of the garment and high-visibility stripes around the upper arms. 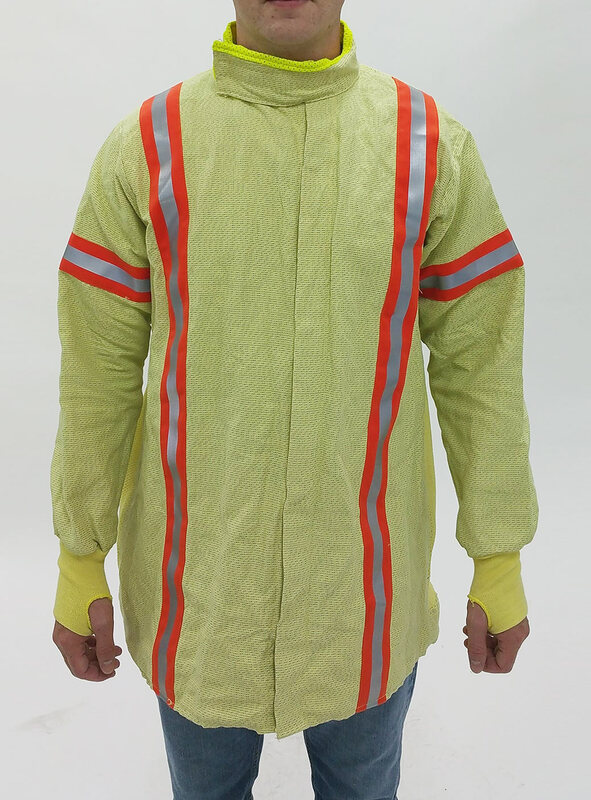 Inherent flame resistant (IFR) Twaron® mesh on the back for safety and employee comfort. Twaron® blend ribbed cuffs with thumb-holes for safety. The TSG-578 jacket combined with TSG-489 chaps combines for a glass garment PPE system with proper fit. The TSG-578 is available in sizes small through 5XL.